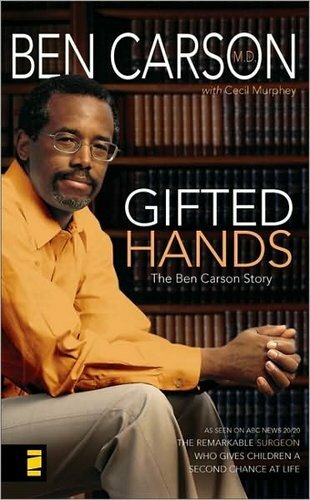 Let me tell you about Ben Carson. He was raised in the ghettos of Detroit by a single mother who had a third-grade education. He lacked motivation, had terrible grades and his explosive temper almost landed him in jail. So how did this African American boy end up graduating from Yale, becoming the director of pediatric neurosurgery at Johns Hopkins Medical Institutions in Maryland and gaining worldwide recognition for separating Siamese twins joined at the back of the head? I’ll tell you how. By his relentless faith in God. I know it’s like a cliche to most of you, but this book really inspired me to actually believe in that. After I read the book, I realized that whatever I want to do or to be I can ask God, and if it glorifies Him, He will give it to me. See what I mean? It’s all in God’s hands. Tell God whatever you want to tell Him. I used to wonder why do we need to tell God how we feel and what we really want if God knows our every thought. Here’s the way I imagine it: God is our Father. If you are a parent and you know what your child wants for his or her birthday, you would want your child to come and tell you what he or she wants. The child will be delighted that you have listend to his or her request on their birthday. God didn’t want him to fail. That night, he dreamed that a figure wrote down the problems and solutions on the blackboard. When he woke up, he quickly wrote down the notes from his dream. The problems that the figure had shown him was on that chemistry test. God answered Ben’s prayer. See? Everything will work according to God’s plan. God has already marked our calenders. It’s just a matter of time.